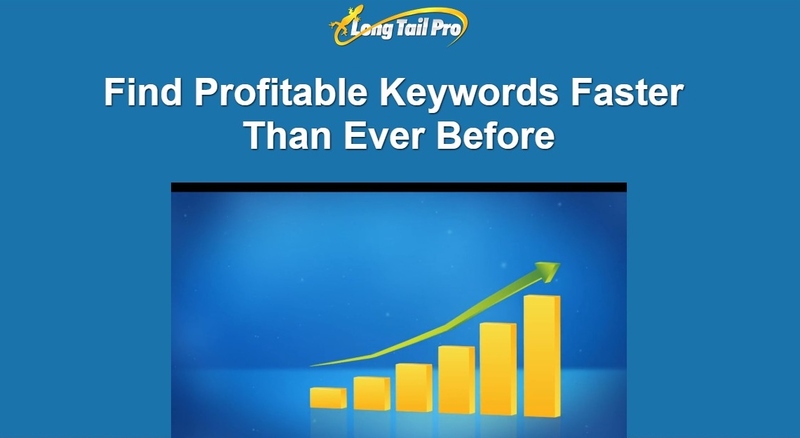 LongTailPro is a popular keyword research tool and software that is used to identify long tail keywords that you can rank for on the search engines like Google and Bing. The tool can uncover and help you find much less competitive keywords that you can then use to rank high in the search engines. Being able to rank for your keywords, will allow you to get more traffic to your website, which will result in more sales. In this Long Tail Pro Review, we are going to talk more about this keyword research tool, its features, and if it is something that would work for you. Long Tail Pro has the ability to help you identify thousands of different keywords that you can start using and ranking for. First, you would enter in something called seed keywords. These are basic keywords that the software will use to then provide you with a number of other more detailed suggestions. Next, you can run a keyword analysis and competitor analysis. The keyword analysis will give you an idea of how competitive your keyword is, what it’s monthly search volume is, and how much people are bidding on it per click. The competitive analysis will give you an idea of who your competitors are and their backlinks that they have. These are based on 13 different metrics. From there, you can determine what your keyword profitability and rank value would be. Your Est. Traffic X Visitor Value = Rank Value. For example, let’s say the traffic you would receive is 50,000 and your visitor value is $4. The Rank Value for this keyword would equal 50,000 X $4 = $200,000. Long Tail Pro gives you three different methods including Related Keywords, Competitor Analysis, and Manual Keywords. With Related Keywords, you can enter in a seed keyword and the keyword tool will come up with a list of long tail keywords you can start using. You can create filters that match your own criteria such as search volume and rank value. With Competitor Keywords, you can take a look at what your competitors are using and review what is already working for them. Just enter in the competitor’s URL and you will be able to get a clear understanding of their keyword strategy. With Manual Keywords, you can input keywords that you already have identified and dive deeper in to see if that keyword would be a profitable one. After all, you don’t want to spend time working on a specific keyword if there is no money to be made. Keyword metrics can be pulled up and you can put in up to 200 keywords at the same time. Long Tail Pro gives you the ability to review and measure keyword competitiveness. The tool measures Avg. KC and provides a score from 0 to 100. It color codes everything so you can quickly and easily determine if the keyword is going to be possible to rank for. Color codes include green, yellow, and unshaded. If the color is green, the difficulty to rank the keyword will be easy. This way, you will know if it makes sense to target a particular keyword. With the Long Tail Pro tool, you can do a competitive analysis to see the top results that appear in the search engine results pages. The software tool does a great job of providing you with a number of different metrics on your competitors. After all, you want to see if you have a good shot of outranking them before you start doing SEO on your site to rank for your keyword. The keyword research tool comes with a Rank Tracker. The good thing about the rank tracker is that it updates your rankings for every keyword that you have on a daily basis. You can review if your keywords are improving or declining, which will help determine if your SEO strategy is working or needs some tweaking. Long Tail Pro comes with extensive training to help get your keyword research off on the right track. There are a number of video tutorials included which will help you in identifying the right keywords as well as creating the right content. 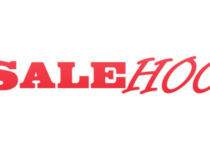 They also have a Long Tail Bootcamp which discusses the essentials of keyword research. After this, they also offer a Long Tail Pro University which will cover more advanced topics including how to do proper link building, coming up with an effective content strategy, digital marketing, and building links. Does Anyone Else Use Long Tail Pro? Long Tail Pro has actually become quite popular. It has been featured on a number of different sites including Forbes, Moz, and Search Engine Journal, and Search Engine Land. One industry leader named Pat Flynn of Smart Passive Income recommends the software as a powerful keyword research tool for any SEO or Internet Marketer. Long Tail Pro has three different plans – Starter, Pro, and Agency. At the time of this writing, Starter will cost you $25 per month, Pro is $45 per month, and Agency is $98 a month. These prices are if you subscribe annually. If you wish, you can also subscribe monthly, in which case the prices would be $37 per month for Starter, $67 per month for Pro, and $147 per month for Agency. The better plans allow you to do more keyword research and do more keyword lookups per day, more keyword competitiveness calculations, and more SERP lookups. The better plans will also allow you to work more with the Rank Tracker and track more keywords and more domains. The benefit of signing up for an Annual Plan is that you get access to Long Tail University. It’s a great resource that will teach you about a number of advanced topics like link building and competitive analysis. 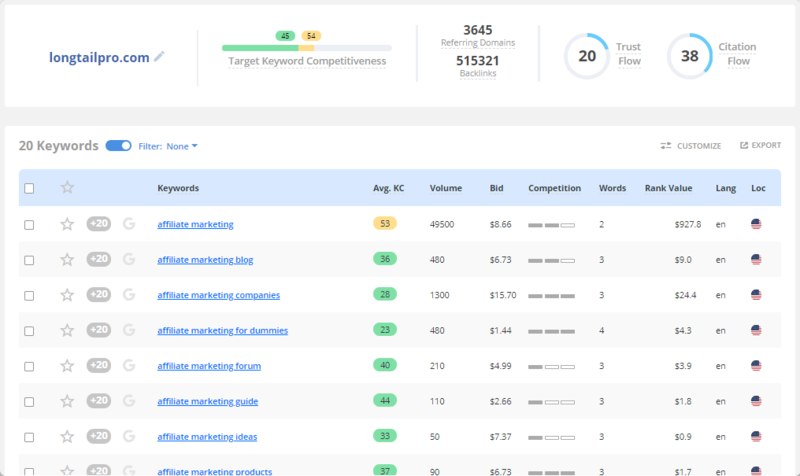 If you are looking for a keyword research tool to help you identify long tail keywords with low competition, this is a recommended tool to get. This tool will help you save a lot of time in identifying the right keywords for your campaign so you can start ranking your blog and website pages in the search engines, driving more traffic to your site, and resulting in more sales and profit. Long Tail Pro is easy enough to learn and use, and is beginner and newbie friendly. Those looking for an affordable keyword research tool to start ranking their keywords will find a suitable solution in Long Tail Pro. 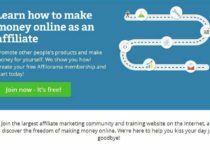 I hope you enjoyed this Long Tail Pro Review and you can visit the Long Tail Pro Site Here to sign up and start ranking your keywords. Click Here to Find out More About Long Tail Pro.